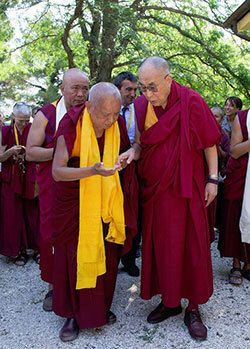 Lama Zopa Rinpoche speaking with His Holiness the Dalai Lama Istituto Lama Tzong Khapa (ILTK), Pomaia, Italy, June 11, 2014. ILTK hosted His Holiness for six days during June. Filmmakers have documented the visit in many beautiful short videos available on the Dalai Lama Italy YouTube channel. Lama Zopa Rinpoche has tea with Jangtse Chöje Lobsang Tenzin Rinpoche, second in line for the Ganden throne, Aptos, US, June 2014. Lama Zopa Rinpoche wrote a thank-you letter to the volunteers who had made the recent Light of the Path retreat go so well. Rinpoche’s focus on how meaningful it is to serve sentient beings is relevant to us all at all times! Thank you sooooooooooooooooooooooooooo much for your really beautiful, amazing, joyful dedication; really beautifully done, all your service, well done! 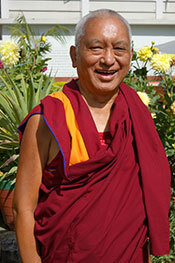 Find Rinpoche’s teachings during the Light of the Path retreat in English, French and Spanish. 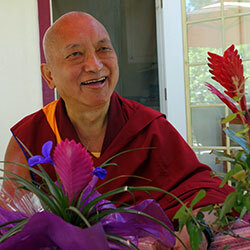 Lama Zopa Rinpoche, Aptos, US, June 2014. Several elements for program completion for the Basic Program (BP) have been added to the Online Learning Center. This is a big step forward in facilitating BP completion, and provides support for the three-month review, the retreat requirement, and the BP final exam (now available online in English, and forthcoming in Italian, Spanish and French). This short practice can be done to make one’s practice of circumambulating holy objects as powerful as possible. Available in eBook, a4, and letter booklet formats. In this short and poetic composition, Lama Zopa Rinpoche outlines the essence of guru devotion and includes a beautiful dedication. Available in eBook format. This new module from the Living in the Path program is composed of Lama Zopa Rinpoche’s teachings from the 2010 Light of the Path retreat in North Carolina. In this course, Lama Zopa Rinpoche teaches the benefits related to each limb of this well-known prayer and how to practice each of the seven limbs in the most effective way. Available as a free module from the FPMT Foundation Store or via the Online Learning Center. 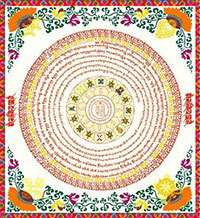 Newest Namgyälma mantra card available from The Foundation Store. The Namgyälma mantra is extremely powerful. This new Namgyälma mantra card is a colorful modern take on our original card and is now printed on shimmery smooth pearlized paper. The Essential Nectar Now Available! The Foundation Store is very happy to have available, after many years out of print, The Essential Nectar, translated by Martin Willson. The root text, by Yeshe Tsondru, is one of the 18 great lam-rim texts. This book contains the root text and a commentary by Geshe Rabten, one of Lama Zopa Rinpoche’s gurus. Now Available for FREE on fpmt.org! Offering gold to Jowo Buddha, Lhasa, Tibet. Each year on Saka Dawa (which this year was on June 13), the FPMT Puja Fund sponsors as many as 9,000 Sangha members to offer a range of pujas and beneficial activities, dedicated to you and all other living beings! Offerings were made to all of Lama Zopa Rinpoche’s gurus and to all the Sangha at international Sangha communities. Up to 9,000 monks offered Druk Chu Ma, Namgyäl Tong Chö, and Medicine Buddha pujas. Gyurme Tantric College recited three versions of the Prajñaparamita. Kopan Nunnery offered 100,000 recitations of Praises to 21 Taras. White wash and four giant saffron flower petals were offered to Bouddhanath and Swayambunath stupas in Nepal, as well as new umbrellas to the stupas’ pinnacles. A new set of robes of the most precious material were offered to the Buddha inside the Bodhgaya Mahabodhi temple as well as the Jowo Buddha in Lhasa’s Jokhang and also gold offered to the holy face of the Jowo Buddha. You can read more about all of the incredible offerings, practices and pujas sponsored this year and also participate by mentally offering and dedicating all of these activities or donating any amount to the fund. Cover of Mandala July-September 2014: Lama Zopa Rinpoche giving the oral transmission of the Vajra Cutter Sutra on Vulture’s Peak, Rajgir, India, March 2014. The new issue of Mandala magazine, July-September 2014, has been published! This issue features stories on how Lama Zopa Rinpoche spent the Days of Miracles in Bodhgaya, India, and also highlights the work some FPMT centers, projects and services are doing to help children and cultivate the seeds of compassion in the minds of the young. Thanks to all who made this year’s Work a Day for Rinpoche campaign a success through their donations and practice. There were contributions from over 32 different countries! It means a lot and we rejoice in all the benefit it will bring to FPMT activities and our supporters. And, it’s not too late to join in! E-Friends Level for Friends of FPMT! Friends of FPMT has a new e-Friends level, which offers a year’s subscription to Mandala magazine online for your e-reader or as a PDF, for a smaller, one-time contribution. Join here today. Celebrate the Sangha on July 31, Wheel Turning Day: Choe Khor Due Chen, which commemorates Buddha’s first teaching and is also FPMT’s International Sangha Day! NB: Consider using the helpful update on IMI sent by director Ven. Chantal Carrerot via the CPMT e-group to find inspiring information to help promote your group’s celebration of International Sangha Day. Lama Zopa Rinpoche Sarnath, India, March 2014. We’ve added four photos of Lama Zopa Rinpoche which Rinpoche recently chose as examples to give to students to the selection of high-resolution photographs of Lama Zopa Rinpoche available for FPMT centers, projects and services to download and use. We’re currently fine tuning the agenda and planning how to facilitate discussion on the key points during the meeting. Don’t miss this special opportunity – book now! Further information and the draft agenda. FPMT International Office, USA is looking for a media resources manager; Root Institute, India has a variety of volunteer positions; Mahamudra Centre, New Zealand and Vajrapani Institute, USA are looking for center managers. Congratulations on affiliating with FPMT, Inc. and becoming a fully-affiliated FPMT project! Thanks to those who corrected the label from “South America” to “Latin America” regional coordinator!